I hope you all had a fantastic weekend! As I try to catch up on life after a busy couple of weeks, I've got a quick recap of our Asheville trip! The weather could not have been more perfect, the leaves more beautiful, or the company any better. I'm warning you, this is going to be total picture overload. I just can't help it with the gorgeous mountain views we had! We actually stayed about 40 minutes outside of downtown Asheville at the Laurel View Lodge in Maggie Valley. It was a bit of a treacherous drive up the one lane, winding mountain roads, but it was worth it for the cabin amenities and the view! The cabin had a hot tub (which I sadly could not use), gas fireplace, a pool table, comfy beds, and lots of space. It was also great if you bring your dog because the deck had a gate so Ruby could walk around without us worrying she would go down the steps. I would definitely recommend it if you are looking for somewhere to stay in the Fall! I'm pretty sure it'd be impossible to get there with any kind of wintery weather. We headed out to the Blue Ridge Parkway on Friday to see the fall colors and this gorgeous view. This is the view from Waterrock Knob, one of the many lookout points along the parkway. 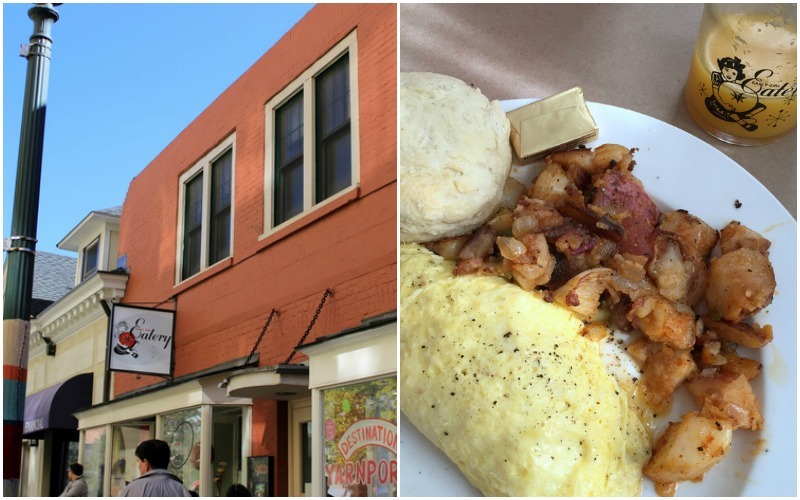 We took a day trip to Asheville and hit up as many spots as possible, starting with Early Girl Eatery for brunch. I had their green tomato omelet special, it was so delicious! Though since everything is straight from the farm, I had to pass on the feta cheese. Boo! After stopping at Three Dog Bakery and getting Ruby some treats, we headed to Wicked Weed Brewery. My parents and my husband really enjoyed the beer, I was pretty jealous of their pumpkin and caramel apple beers. We also grabbed some tacos to go from White Duck Taco. They were the perfect snack later at the cabin. The Thai Peanut Chicken taco was my favorite! I'm so sad that the weekend is over already, I miss having my hot apple cider and breakfast on this deck! It was such a great weekend away with my husband and my parents, but now we're back to the reality of Monday... work, an empty fridge, and 6 loads of laundry. Lovely! This post makes me so excited for our trip in December!! 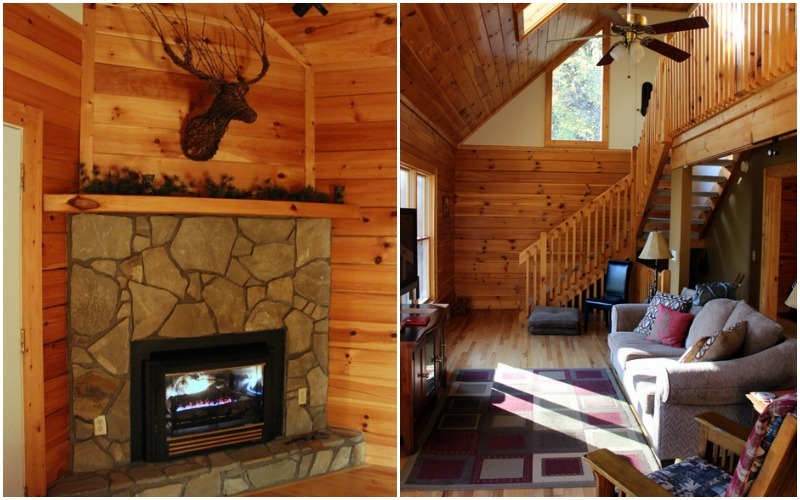 Your cabin looks so cozy! Definitely going to hit up the Early Girl Eatery when I go and of course Wicked Weed because Theo won't stop talking about it! You know we have a White Duck Taco on James Island now. You've got to frame that pic of you, Ruby and Steve!! Oh Cait - this weekend looks divine and SO FALLish! I love it! What great weather you seemed to have! And little Ruby looks as cute as ever. What fun! I have never been and it looks like something I would just die over! Beautiful! Such great pictures. Looks like a lovely weekend! What a beautiful weekend! I definitely want to take a trip up to Asheville soon! How long did it take you to get there? These photos are so beautiful! Nothing beats fall in the mountains -- just stunning! I knew you'd have gorgeous scenery, but it is even more pretty in your pics! What a fun weekend. Totally want to stay at that house soon now! omg those views!! I LOVE the mountains in the fall, so gorgeous! This looks like so much fun, and you got great pictures too! Jealous of your getaway! That's my hometown!!! If you ever need more recs let me know! Gorgeous pics! What a perfect weekend! I love Asheville! Beautiful pics! It looks like you had a wonderful weekend!! What a gorgeous place! I'm glad you enjoyed your trip. The cabin and the views are beautiful! Looks like a great place to relax. What a fun getaway! I'm glad you were able to enjoy your time together!